The 2016 West Coast Championships were hosted this past weekend at the Santa Barbra Yacht Club’s Fiesta Cup. J-70 fleet is gearing up for the 2016 Worlds in San Francisco and the competition is starting to ramp up. Alex Curtiss reports from a great regatta. “The fleet of 11 boats started on Friday with two races. 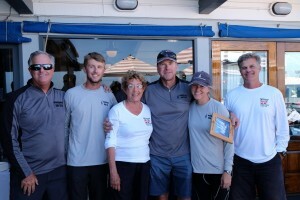 Pat Toole and their team “3 Big Dogs” won both races in convincing fashion. Saturday saw the breeze start light and at a heading of 160 degrees. It then shifted to the right, to the more traditional Santa Barbara breeze direction, and strengthened to close to 20 knots. Steve Wyman and his team “Nunuhunu” took the day with a 1,1,2,4. The final day went back to the 160 degree wind heading at 5 knots. Steve Wyman and his team put the pedal to the metal and won t he first race to secure the win. The second race was won by Pat Toole’s team, which gave him second for the regatta.